Canada and Japan seems to be the first two countries to be visited by the Galaxy Nexus, the first phone based on Android 4.0. It is delivered by a spokesperson from Google and Samsung to Electronista. Plan a few hours longer Galaxy Nexus will be announced in Hong Kong and we have learned several key specification information and pictures appearance again. For Canada, the spokesman did not say when the exact date of launch. He said that the launch in Canada will be made soon. Regarding more detailed information, he said, will be given the next few weeks. 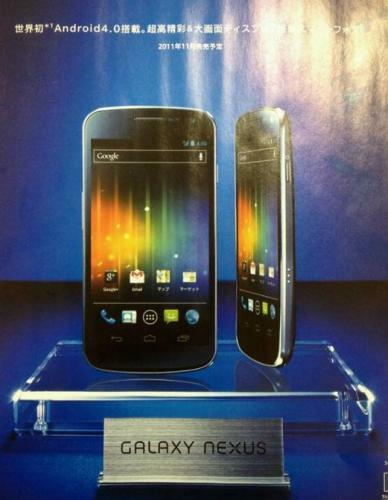 Meanwhile, Japan will become the first Asian country to host country Galaxy Nexus or Nexus Prime. Phone operator NTT DoCoMo in a twitter account to say that Nexus Prime is coming soon. The possibility of mobile phones will be available in November. Communication Systems (GT-I9250/GT-I9250M/GT-I9250M/SC-04D): W-CDMA, GSM phone (SCH-I515): LTE, CDMA2000 Packet (GT-I9250/GT-I9250M / GT-I9250M/SC -04d): HSPA, EDGE, GPRS (SCH-I515): LTE, EV-DO Rev.